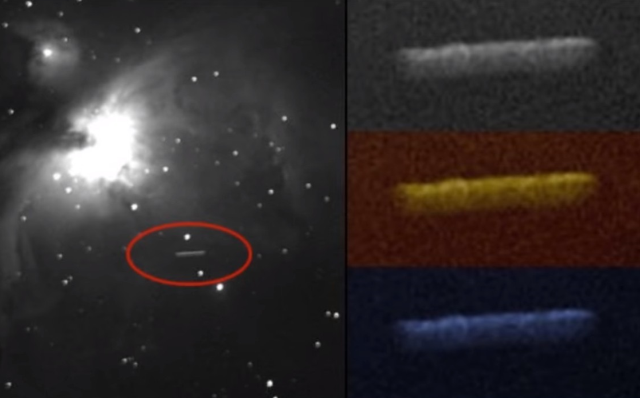 The footage shows the Orion Nebula and surrounding space when suddenly a white colored large cigar-shaped UFO appears out of knowhere with two cigar-shaped UFOs on each side of the craft. 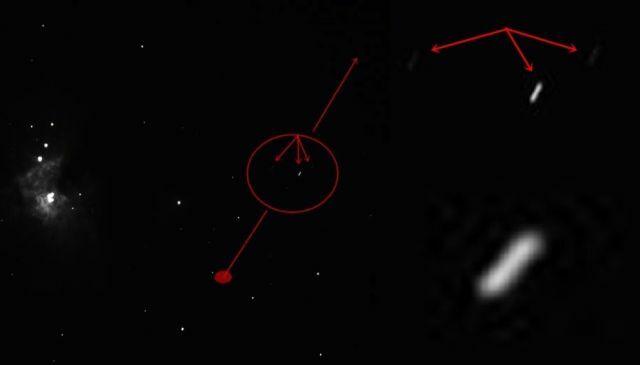 The two UFOs are less visible, maybe they fly at a further distance from the white colored UFO. 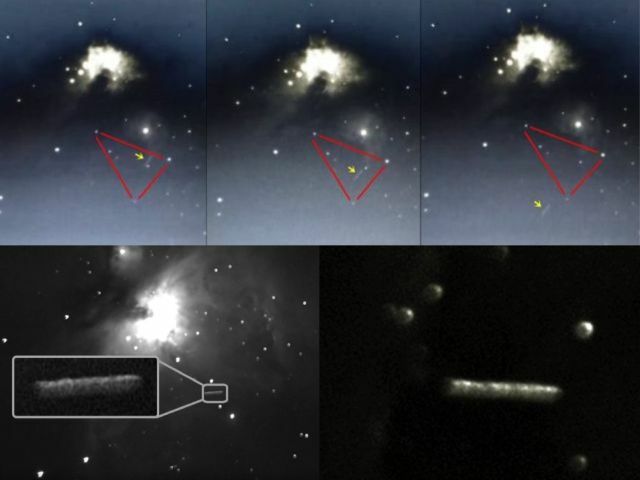 With all the other older footage's of UFOs near the Orion Nebula, this footage is again proof that many of these interstellar alien spacecraft are present in the Orion Nebula sector. The Orion Nebula (also known as Messier 42, M42, or NGC 1976) is a diffuse nebula situated in the Milky Way, being south of Orion's Belt in the constellation of Orion. Any guess as to The size? 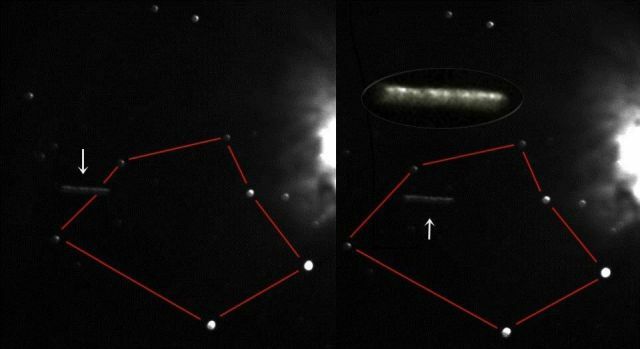 when analyzing these photographs,very carefully using Forensic Enhancement Software,then certain characteristics come out very clearly,these are very large UFO Space Craft,based on in depth knowledge about such craft,it can be established,about its size....if you analyze similar photographs with smaller ufo space craft,then you can estimate the size as follows..smaller circular ufo space craft,average diameter,in its circular,,circumference is 100m-200m..in relation to these cigar shape ufo craft,we can get a very good accuracy,of how large they are,by stacking the circular,ufo space craft,in relation to FOV Field Of View in relation to the nearest neighboring objects in such photographs based on similar photographs.the estimated size of these cigar shaped ufo space craft are +=500m-1000m in Length-200m-500m In diameter/circular,these are UFO Mother Space Exploration Craft,so what would they be doing in the Orion Nebulae?..based on what we know,as to how Extra Terrestrial Beings/Aliens molecular structure exists,and as to how there space craft are designed,then we can assume these are mining ufo space craft,in search of minerals which could be found in the various nebulae,such as in Orion,this star cluster is where new stars are formed,from various gaseous substances which could be present..so these UFO Cigar Shape Space Craft are most probaly en route into the Star System/Cluster on a Mining Exploration Etc..